MattsBits - USB Flash Drive Speed Test - How Fast Is Your Stick? USB Flash Drive Speed Test - How Fast Is Your Stick? If you've got a USB flash drive or SD card and need to find out how fast it is then you can use a free utility called SpeedOut to perform a speed test and measure the read and write speeds. These tests are worth doing if you have purchased a new usb stick and want to check it is performing as expected. Knowing your flash drive is working ok is a good idea before you start using it to store data. You can download SpeedOut from https://sites.google.com/site/mbentefor/projecs-speedout. It does not need to be installed and is completely portable. The application will perform 4 read tests followed by 4 write tests. 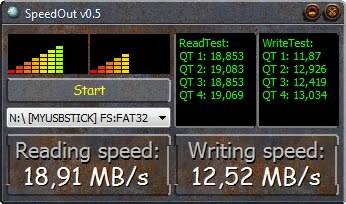 The average read and write speeds are then displayed. The read speed is most likely to be larger than the write speed. The average of the two numbers will indicate what "Class" the flash storage device is.